Algoriddim – notorious for their iOS DJ apps – just announced a new version of their pro-level DJ software, djay Pro 2. This is a Mac-only release, and has features that both casual and professional users will find intriguing, from machine-learning driven auto-mixing to accessibility features for the visually impaired. What’s New In djay Pro 2.0? It might be a little hard to keep track of all of Algoriddim’s various software that they’re maintaining. It’s an impressive array of offerings for various platforms – but consider djay Pro to be the pinnacle of what Algoriddim is working on. This is the program that they put as many innovative features in and target the professional and prosumer DJ customers with. Automix AI: Using machine learning and training sets from human DJs, Automix AI intelligently identifies rhythmic patterns and the best intro and outro sections of songs. Automix AI calculates optimal fade durations and automatically applies parameter changes to EQs and filters for a seamless transition. Beats and tempos are matched using Morph which ensures that a song’s BPM is maintained during a transition. This innovative song mixing technology allows for seamless cross-genre mixes with varying tempo. any time. Using the transition button, users can trigger a seamless mix to the next song at any time. Advanced Media Library: An advanced library management system that is built around a sophisticated integration with Spotify, iTunes, Video, Photos, and the file system. djay Pro 2 now also offers its own playlists that make music management easier than ever. These appear in their own tab in the library manager, and allow users to create their own custom and smart playlists. Via the split view, users can even manage their songs from iTunes and Spotify side by side. To help organize users playlists and quickly locate songs, djay Pro 2 includes a powerful Smart Filter. With 12 different criteria, users can create rules that display exactly what they need, either to create permanent playlists, or to temporarily find a specific song. PhotoBeatTM: Users can drag an album or a selection of photos onto the visual decks and djay Pro 2 creates a beat-matched slideshow. Photos are cycled on beat and the rate can be adjusted on-the-fly in a range of a 1/4 beat all the way up to 4 beats per photo. Users can also apply effects to their photos in the same way as video, and output via an external monitor through HDMI or AirPlay. Accessibility: Every feature of djay Pro 2 has been carefully adapted for Accessibility, so vision impaired users can seamlessly dive into the experience. With VoiceOver enabled, users hear a description of everything happening on their screen through their headphones independent of the mix that is playing through the main speakers. Keyboard Shortcuts Editor: a full keyboard editor which allows users to assign any feature in djay Pro 2 to a custom keyboard shortcut. 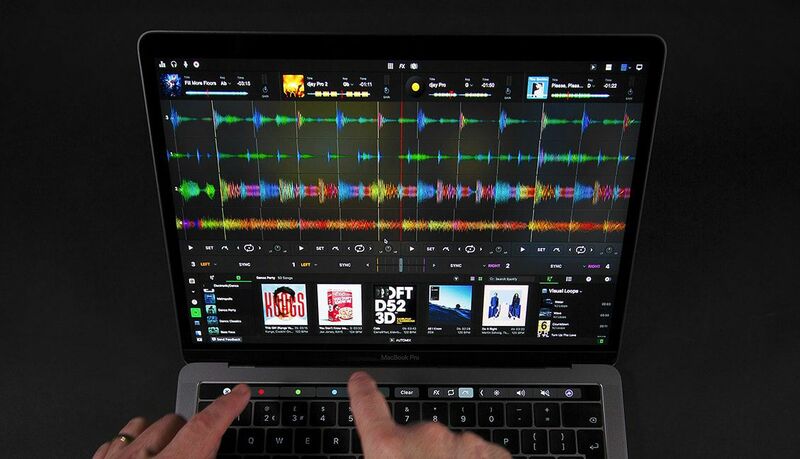 This is especially useful if users work with the Touch Bar or a hardware controller and want to add more instant features to their setup via the keyboard. Hardware Integration: djay Pro 2 integrates seamlessly with existing professional DJ hardware and is officially certified by Pioneer DJ for plug and play integration with their CDJ line up, the worldwide standard for performing DJs. In addition, over 60 MIDI controllers are supported out of the box and can be re-mapped via djay Pro 2’s extensive MIDI learn system.